It is an example of quanxi—connection. Melody Zhang, Associate Director for Children’s Hope in China, shares a friendship with Song Li Xin which is bringing a shining light to the intense need of poverty-stricken and orphaned children in China. 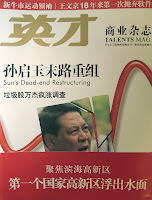 Song Li Xin is the publisher of the China business magazine Talents, targeted to the successful corporate CEO. A full-page ad in their magazine is valued at $12,500. She printed ours at no cost. The ad brings attention to the need for 40 orphanage rehabilitation centers to aid the nearly 1.8 million brain damaged children under the age of 13 suffering from cerebral palsy in China. Due to poverty and limited medical services, many China families struggle to provide for their children with this special need. The Children’s Hope ad will bring awareness to a broad Chinese audience. 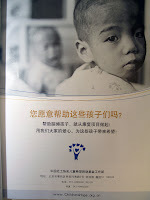 This awareness is a Children’s Hope goal to not only provide care, but also to spread education and resources to poor families on the importance of treating childhood disease prenatally and at early onset...and also bring more people together through quanxi, to make a real difference for China's children with special needs.